Any household needs a quality sewing machine. However, finding the perfect one isn’t as simple as it seems. Although the average person doesn’t necessarily need a heavy duty sewing machine, we can’t deny the fact that having one at home brings a lot of benefits. Owning an advanced sewing machine is the best choice you can do when it comes to this type of gadgets. If you’re wondering why know that this type of machine allows you to finish larger projects like sewing thick materials like leather and denim. You might also use it for quilts. As you can see, these types of sewing machines have a flexible system. It’s both durable and dependable. 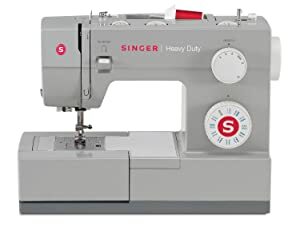 But, before you buy this type of sewing machine, it is recommended that you pay attention to some features these advanced sewing machines have like durability, how many stitches per minute and what type of fabrics can it sew. What are The Benefits of Having a Heavy Duty Sewing Machine? 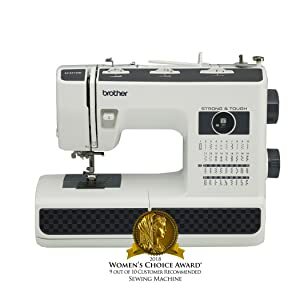 Top 5 Best Heavy Duty Sewing Machine 2019! What is The Main Purpose of Heavy Duty Sewing Machines? What to Look For in The Best Heavy Duty Sewing Machines? What Type of Sewing Machine Do You Need? What Composition of Sewing Machine Do You Want? How to Pick The Best Heavy Duty Sewing Machine? How Much Should I Spend on a Heavy Duty Sewing Machine? In order to pick the best-advanced sewing machine, you have to know the features and benefits that come along with the product. First and foremost, a high-quality advanced sewing machine delivers a substantial and secure sewing environment and best results. And by “best results” we mean that you won’t be facing ordinary issues people deal with when working with a regular sewing machine like skipped stitches. This type of machine will stay put in the footprint. Plus, if it’s really advanced, it should have more brass and stainless steel parts than plastic parts. Otherwise, it may not serve you for a long time. One of the main benefits of making an upgrade to your usual machine is that you get faster results and improved sewing experience. Just using a professional sewing machine might make you feel like a pro even if you’re just a newbie who wants to learn how to sew like a pro. Plus, you will be able to create materials like leather, denim, multiple layers of fabric, custom purses, blankets, quilting and much more. However, as amazing as this sounds, keep in mind that these type of machines are strong but also a bit complicated. The best sewing machine will be able to sew just anything that pops into your mind at the moment. It will last for years and you won’t have to worry about using it every day because it is designed for professionals who sew larger projects on a regular basis. It is stiff but should have a free arm that allows you to style your custom projects too. To learn more about advanced or industrial sewing machines, check this video! What type of sewing machine would meet your needs and requirements? We are here to discover that for you and compare some of the best products on the market right now. With the Janome sewing machine, you will not experience pain in your eyes anymore. It has an automatic needle threader which makes it easy to use and frustration-free. It is also very easy to change the bobbin. You don’t have to worry about running off the edge of your fabric because it’s a jam-proof bobbin system. It offers 18 built-in stitches. Just select your favorite stitch and it will appear right before your eyes. We don’t know if you remember, however, in the beginning, we said something about buying a sewing machine with an adjustable presser foot pressure and adjustable speed control. You can sew shirt sleeves and pants legs using the free-arm. And the best part of this product is that it comes with free accessories like 2 packs of leather needles, a hard case, a pack of universal needles, ultra glide foot, buttonhole B foot, rolled hem D foot, overedge C foot, blind hem G foot, 1 pack of bobbins and other accessories. You also get a warranty card and an instructional manual for beginner’s use. It has 18 built-in stitches. Expensive parts to replace in case of a breakdown. Second on our list of top 5 that is considered to be one of the best-advanced sewing machines for denim and also the best heavy duty sewing machine for leather, is Singer sewing machine. With 23 built-in stitches, it allows you to complete different projects. Just like the Janome HD3000 heavy duty sewing machine, this one too comes with an automatic needle threader. This is an important feature that we didn’t mention before but it will reduce your eye pain, cut frustration and boost your mood before sewing. Plus, it is a high-speed sewing machine. Now, we mentioned that it is not that important for a sewing machine to be very fast. It is more important to have adjustable speed control. This one has a 60% stronger motor than the rest of the machines on the list. It also has a metal frame and comes with different free accessories like an all-purpose foot, button sewing foot, needles, bobbins, zipper foot, and a 25-year warranty. It comes with 23 built-in stitches. Some find it complicated to use. Here’s a short video about SINGER Heavy Duty 4423 Sewing Machine! Just like Brother cs6000i, the Brother ST371HD sewing machine is both strong and tough. It is durable and designed for high volumes of work. It offers top results and precision. Dependable, durable and versatile, the Brother sewing machine will provide you will an easy and exciting sewing experience. It can sew different fabrics, like silk, denim, and leather. It is also said to be the best heavy duty sewing machine for canvas. It arrives with a metal needle plate to keep the threading mechanism well protected and improve the thread pick up speed. It also has a sturdy metal chassis for stability and constant stitching at high speed. It is easy to store thanks to the built-in handle. It can sew different types of fabric. 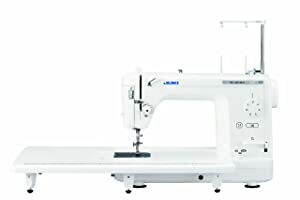 If you decide to give JUKI TL-2000Qi sewing and quilting machine a choice, which by the way, was also the editor’s choice, you will get one of the best sewing machines on the market. It has a pedal operation and LED lights to brighten up your workspace. With 1.500 stitches per minute, it will help you finish all your larger projects fast. It has an automatic needle threader like most of the sewing machines on our list and has a straight stitch. It also has a bed for low vibration operation and aluminum die-cast arm. The best part is that it comes with an extension table, so you can work on your larger projects with ease. It provides a comfortable, stable and flexible broad workspace. If you’re a beginner, don’t worry because it also comes with a user manual for setting up. Some people don’t receive any instructions. If you were looking for a computerized sewing machine, this is the perfect choice for you. It has a lot of easy-to-use features that will help you finish the most complicated customized projects. The Singer Quantum stylist 9960 sewing machine will make your sewing dreams come true and offer the best sewing experience. Just like other sewing machines, it has an automatic needle threader that eliminates stress and eye strain. It is one of the best heavy duty sewing machines for denim, leather, canvas, and other fabrics. It comes with 600 built-in stitches that you can use with a touch of a button. It is a high-speed sewing machine with a maximum speed of 850 stitches per minute. It offers fast sewing. However, keep in mind that speed is not one of the most important features in a sewing machine. It is more important to buy one with adjustable speed control, which doesn’t happen to be the case with this sewing machine. It comes with free accessories such as button sewing foot, buttonhole foot with underplate, open toe foot, zipper foot, and others. Before you buy, keep in mind that it is designed for Canadian and the United States use only. This, according to us is one of the biggest disadvantages of this strong workhorse. Made for the United States and Canadian use only. There is a lot more to pay attention to when purchasing a sewing machine, but these are the most important things. If you wonder what is the difference between the usual and an advanced sewing machine, know that the second type comes with upgraded features like smoother sewing performance and adaptability for larger, harder sewing projects. It is very important to know how many stitches can it sew per minute before you buy it because this feature tells if it will be able to meet your needs as a professional sewer. As you can suppose, this type of sewing machine requires less maintenance. They’re not built of cheap plastic parts but stronger and thicker metal. They’re also heavier than a usual machine. However, these are considered as advantages, and not as weaknesses. You have to understand one thing before you take the next step and purchase a sewing machine today. Not every sewer needs a heavy duty sewing machine. Of course that you will enjoy a lot of benefits if you have one at home, however, it might not be necessary if you don’t sew professionally or own a clothing company that creates custom fashions. If you want to learn some powerful sewing tips for beginners, watch this video! Remember that the main purpose of this type of machines is to satisfy the wants and needs of professionals. That’s why they come with features with industrial strength. If you want to invest in something that will serve you in the long run, purchasing an advanced sewing machine is the best choice you can make. As mentioned before, it does require a lot less maintenance than the regular sewing machine but it will serve you for a long time. If you are not using your regular sewing machine on a regular basis, you might not need this type of upgrade. Just like we do with every other product we purchase, we have to know if we need it first. If you have already made up your mind, we sincerely hope that our reviews on the best-advanced sewing machines and top picks for this year will help you pick the one. No matter if you’re looking for an industrial sewing machine or something advanced to practice with and take your sewing skills to the next level, these are the features you should look for in an advanced sewing machine. Follow these tips and pick the best one. If you’re a professional, then you probably know that sewing machines are categorized into 5 different types: automated/computerized, electric, overlock, mechanical sewing machine, and embroidery. The computerized or automated is made with high technology and you can connect it to the internet. The electric sewing machine has more features than other like mechanical, and motorized functions, while a mechanical one comes with the basic setting. It is the best sewing machine for beginners. The embroidery machine works for different patterns of embroidery and is mostly used for industrial purposes. The overlock sewing machines are also known as sergers to seam/overlock the fabric. The way a sewing machine is built is very important as well. Advanced sewing machines are usually heavier than the usual ones because they’re made of iron or steel instead of plastic and other cheap material. Both the metal frame and robust exterior of it should be able to withstand a lot of pressure and force. For example, Singer 4423 is an actual workhorse. It has a metal interior frame, powerful motor, extra-high sewing speed and other features that you can learn more about from the reviews later in this text. It is also important that your advanced sewing machine is stable, easy to move and durable. Speed might be the most important feature you should pay attention to when buying an advanced sewing machine. The speed control should be adjustable and provide excellent sewing experience. And by “excellent sewing experience” we mean not having to stop to readjust your material every second. It is recommended that you buy a sewing machine with adjustable, variable speed control, so you can adjust it to what you’re working at the moment. People assume that the faster the machine, the better. However, it is not always the case. Some materials are more complicated to sew than others and require a slower sewing speed to get it done. That is why you need an adjustable speed setting. Another important feature you should look for when buying your first advanced sewing machine is the number of stitches available. This will discover the real sewing capacity of the machine. It is recommended that you buy a sewing machine with various stitching options. For example, the Janome HD3000 offers 18 stitches. You should also look out for the number of stitches per minute because this discovers how efficient the sewing machine really is. For example, a high-quality advanced sewing machine offers several hundreds of stitches per minute. A typical sewing machine offers somewhere between 800 and 2.000 stitches per minute. This is important because it allows you to sew a lot more layers than the regular machine. And provide you with easy sewing experience. Last but not less important is the presser foot lift. Most machines have one or several presser foot lifts. If you’re a beginner who wants to skip the basics and want learn how to sew like a pro, you probably don’t know that the presser foot lift contributes to the feeding mechanism that holds down the material while being sewed. It is very important for your advanced sewing machine to have at least one of multiple foot lifts, especially if you plan on sewing thicker fabrics or layer of thick material at the same time. Your sewing machine should flexible, stable, and very easy to work with. With so many options on the market, choosing the best product can be a bit challenging. However, that is why you have us to guide you through the buying process with relevant information and reviews. Most advanced sewing machines offer consistent work and have over 600 stitches that you can use with a press of a button. They’re one of the best on the market right now. It came to our knowledge that one of the most purchased sewing machines is the Serger machine. It comes in universal 2, 3 and 3 formats and provides stretchy seams to support your curtains, clothing or different projects with long-term treatment. However, if you do your own research, you will find out that even though serger sewing machine lasts for years and will help you create quality products, it still can’t replace an advanced sewing machine. It doesn’t have options for buttonholes, zippers, facings, and topstitching. While an advanced embroidery machine provides top results and is worth the investment. However, take your time to think about what suits you best. 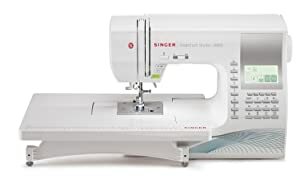 If you were wondering how much an advanced sewing machine costs, know that you can purchase the best heavy duty sewing machine for under $200. The price might exceed to $300, however, not more than that. If you find this too expensive, keep in mind that this type of machines are professional, made of strong materials and suitable for large projects. They make a good investment. However, remember that the price depends on the features, brand, and specifications. Some high duty sewing machines are sold at a price of $1000. Most professional sewing machines have a 2-year warranty on the electrical pieces. And over 25-year warranty on the exterior. However, this also depends on the brand and material that is made of. 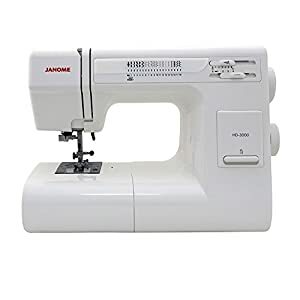 According to our deep research, we have concluded that Janome HD3000 is best heavy duty sewing machine for beginners, while the Singer heavy duty sewing machine is the most affordable one. However, the JUKI TL-2000Qi is what caught our eye the most. It is mentioned as the ‘editor’s choice’ because it is both affordable and top-quality product worth the money. However, it is your money and you decide what to buy with it. Pick the one that suits you and your needs best. We honestly hope that we helped you decide what advanced sewing machine to buy and made it easier for you to pick the one most suitable for you. If you liked this buyer’s guide and found it useful, share it with a person you love. Also, feel free to follow us on social media. Stay updated on new buyer’s guides and reviews.